VANCOUVER, BC – February 24, 2009 – Mirasol Resources Ltd. (TSX-V: MRZ; Frankfurt: M8R) Mirasol is pleased to announce new high-grade gold results at the Loma Arthur prospect, and the definition of bulk-tonnage, gold targets at the Cerro Chato prospect located within its wholly-owned La Curva Project, located in Deseado Massif of Santa Cruz Province, southern Argentina. Mirasol’s geologists identified and staked La Curva in 2006, as part of its regional generative exploration program. Fieldwork completed since May 2008 (see press release of April 11, 2008) includes: induced polarization (IP) and magnetic geophysical surveys, soil (lag) sampling, additional prospecting and rock sampling (275 samples in total). Lag soil sampling over Loma Arthur shows a gold-tellurium signature to the system and has identified a new gold anomaly 100 metres north of the known veins, suggesting mineralization may extend into that area. 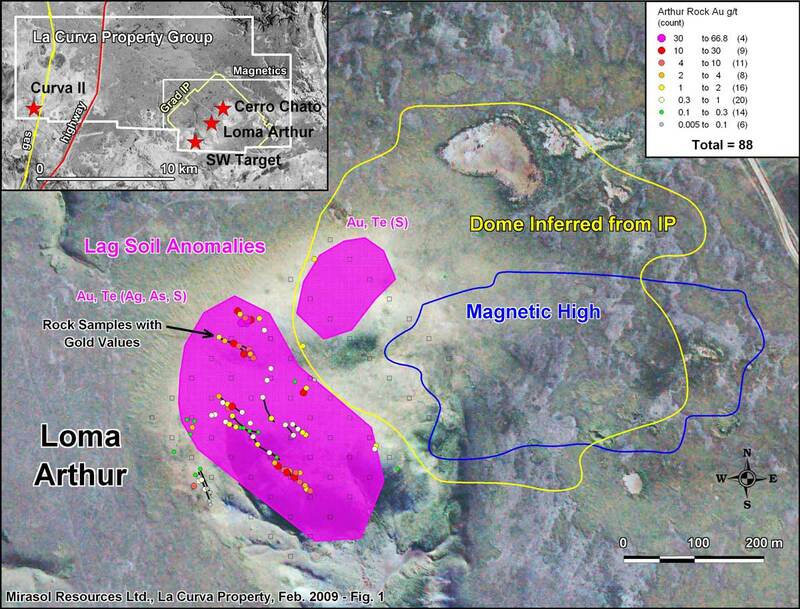 Detailed ground magnetic, gradient IP surveys at Loma Arthur have defined a magnetic high partly coincident with distinctive chargeability and resistivity IP values immediately to the east of the Loma Arthur gold veins. This 500 metre diameter geophysical feature may represent a covered volcanic dome; the subcropping Loma Arthur veins occur on the southwest edge of it. The remainder of the covered flanks of the interpreted dome represents an untested target for additional gold mineralization at Loma Arthur. Rock chip sampling with complementary gradient IP and pole-dipole IP surveys have identified an exciting new prospect at Cerro Chato, 1,400 metres north-northeast of Loma Arthur. The region between the two mineralized areas is covered by soil and gravel. Cerro Chato forms a large, low, shield-like hill measuring 1,200 by 2,000 metres with broad pervasive silicification of host rhyolite tuffs (Figure 2). The surface expression of the Cerro Chato mineralization comprises quartz-adularia veins and pervasive silicification in subcrop and float. In the best mineralized area found to date, up to three vein trends exist in a 40 by 40 metre area (see inset box in Figure 2). Within this area 14 rock chip samples have assayed between 0.017 and 6.8 g/t gold with an average of 1.57 g/t. From the remainder of the Cerro Chato hill 77 rock chip samples collected assayed between 0.01 to 2.24 g/t gold with an average of 0.18 g/t. Lag soil samples were collected over an area of 1,000 by 1,300 metres at Cerro Chato. Assay results have identified two anomalous zones of gold plus pathfinder elements, and a third zone of pathfinders with low gold. Soil gold anomalies are developed over the 40 by 40 meters area of mineralization described above, but the most intense soil gold anomalies are not coincident with it and lie uphill and north of it. Priority ground follow-up of these soil anomalies is in progress. 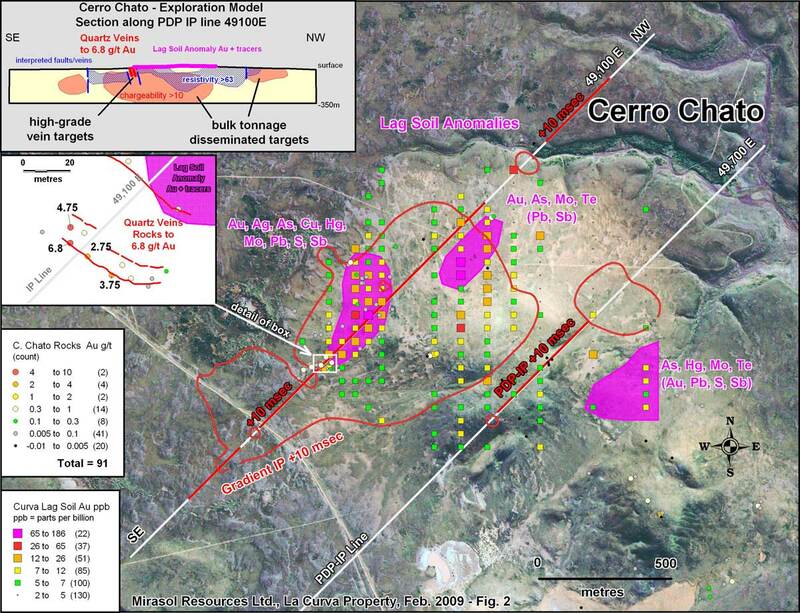 A Gradient Array geophysical survey over the Cerro Chato prospect outlined an IP anomaly of approximately 600 by 1,300 metres encompassing the rock chip and soil gold anomalies. Follow-up pole-dipole IP lines show the chargeability anomaly to be generally flat-lying and greater than 100 metres thick with a resistive upper cap. The combined geochemical and geophysical signature suggests potential for bulk-tonnage gold mineralization at Cerro Chato. Paul Lhotka, Principal Geologist for Mirasol, is the Qualified Person under NI 43-101 who has prepared and approved the technical content of this news release. Quality Assurance/Quality Control: Exploration at Mirasol’s Projects is supervised by Mirasol’s Stephen C. Nano, Vice President of Exploration, Exploration Manager, Timothy Heenan, and Principal Geologist, Paul Lhotka, all qualified persons under NI 43-101. All technical information for the Company’s projects is obtained and reported under a formal quality assurance and quality control (QA/QC) program. Rock chip and stream sediment samples are collected under the supervision of Company geologists in accordance with standard industry practice. Samples are dispatched via commercial transport to an ISO 9001:2000-accredited laboratory in Mendoza, Argentina for analysis. Results are routinely examined by an independent geochemist to ensure laboratory performance meets required standards.